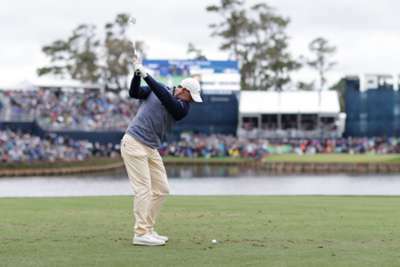 Rory McIlroy emerged from a packed field to claim a thrilling victory at The Players Championship at Sawgrass on Sunday, sounding a warning to his Masters rivals. The four-time major winner recovered from a double-bogey six at the fourth to card a 70 and finish on 16 under, one stroke ahead of Jim Furyk, securing his first PGA Tour win since the Arnold Palmer Invitational 365 days ago. Jon Rahm, who held the overnight lead by one stroke from McIlroy and fellow Team Europe Ryder Cup star Tommy Fleetwood, faded badly to finish five back. Fleetwood ended up on 13 under alongside world number one Dustin Johnson and Brandt Snedeker, while Tiger Woods claimed a tie for 30th on six under. On a day when the lead was shared among many hands, Jhonattan Vegas' 66 thrust him into an increasingly crowded picture that also included Eddie Pepperell, whose own 66 featured an incredible 50-foot birdie putt at 17. Vegas and Pepperell reached the clubhouse on 14 under, but their hopes were ended when Furyk - the American Ryder Cup captain in 2018 - picked up a shot at the last to be one better off. That left McIlroy, Rahm, Fleetwood and Snedeker as the most likely contenders, along with Furyk. With Rahm and Fleetwood in the final group, the former's challenge faded following a bogey at the 15th, but an eagle three at the next hole gave the Englishman cause to dream. However, Snedeker bogeyed the last before Fleetwood and Rahm found water on 17, meaning a closing par was enough for McIlroy to get the job done. The Northern Irishman, who was already a leading contender for Masters glory, will now be the man to beat at Augusta as he seeks to end his elusive search for the career grand slam.